For the French, the fleeting interlude between a long workday and the evening meal to come is not meant to be hectic or crazed. Instead, that time is a much needed chance to pause, take a breath, and reset with light drinks and snacks. Whether it's a quick affair before dashing out the door to your favorite Parisian bistro or a lead-up to a more lavish party, Apéritif is about kicking off the night, rousing the appetite, and doing so with the carefree spirit of connection and conviviality. Apéritif celebrates that easygoing lifestyle with simple yet stylish recipes for both classic and modern French apéritif-style cocktails, along with French-inspired bites and hors d'oeuvres. Keeping true to the apéritif tradition, you'll find cocktail recipes that use lighter, low-alcohol spirits, fortified wines, and bitter liqueurs. The impressive drinks have influences from both Old World and New, but are always low fuss and served barely embellished--an easy feat to pull off for the relaxed host at home. REBEKAH PEPPLER is an American writer and food stylist living in Paris. Her clients include the New York Times, Bon Appétit, Real Simple, Food Network, and multiple cookbooks. You can find more on rebekahpeppler.com and instagram.com/rebekahpeppler. "With witty and honest prose and stunning photography, this book is one to keep out on the coffee table (or bar cart)." "Step aside, Italian aperitivo. This book moves over into the equally stylish and luxurious territory of the French cocktail hour, providing recipes for classic and contemporary before-dinner French cocktails, along with light bites." 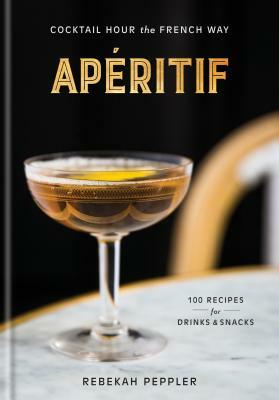 “J'adore Rebekah Peppler's beautiful book Apéritif! As someone who pines for France regularly, this book makes you feel as though you're not that far away. Peppler's fun, conversational voice shines through and encourages readers to recreate their own l'apéro hour at home and gives you the tools to do just that. Beautiful images are showcased alongside witty stories and approachable recipes. I'll be cooking and drinking from this book often. Santé!" "Just like its recipes, Apéritif is bright and refreshing, piquing the palate with its stylish modern take on a French tradition. It’s the A.P.C. of l’apéro!"